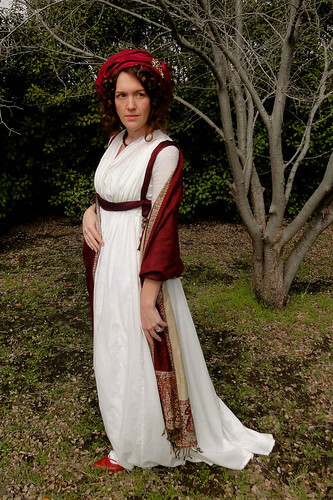 This weekend was the Antique Elegance Show, and I ended up wearing my white 1790's round gown for the 3rd time in 4 months. I think that's a new record for me since I usually hate to repeat costumes. 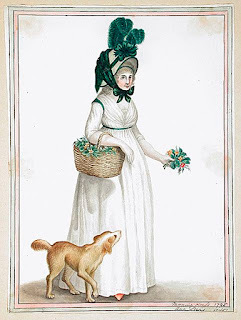 But each time I've worn it in a slightly different way, which is one of the most wonderful things about Regency dresses - they are so versatile! This time, I wore the dress alone with just a silk sash wrapped around my waist and shoulders in a way that is similar to these illustrations. I've read that this revolutionary fad was known as croisures à la victime, making a symbolic "x-marks the spot" on a woman's back. I'm not sure if this is true or just a fashion myth, but here's an interesting webpage about it. I also wore my new-and-improved paisley shawl. 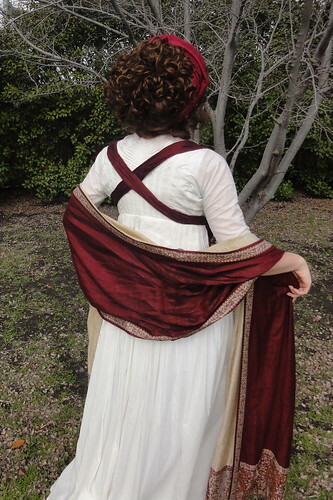 After I wore it last month, I decided to buy a second shawl that was the same as the first and sew them together to make one super-long shawl, which is much more appropriate for this era. I'm so much happier with it now, and it might be my new favorite accessory ever. 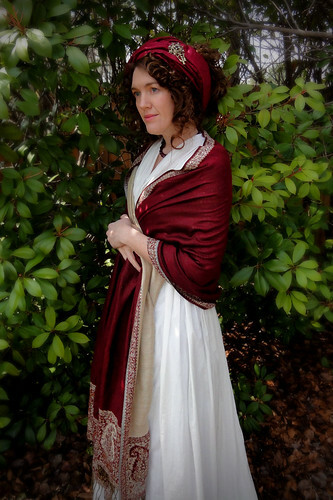 I also wore my turban from the first wearing of this dress, but I left off the wheat spray so I wouldn't be as likely to knock things over with my crazy headwear in the booths while shopping. I didn't buy very much this time at the show, but I had fun hanging out with some friends, lusting over the gorgeous fur muffs and seeing all the antique dresses. And as always, it was wonderful to have an excuse to dress up. Here are a few more pictures of my dress just for the heck of it. How very pretty. 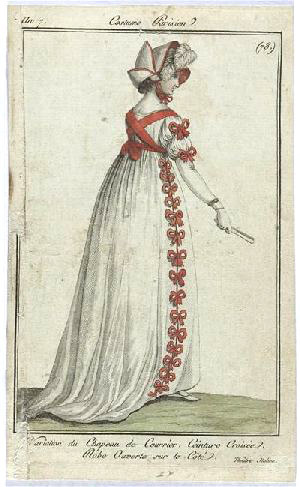 I wondered about the wraparound I've seen on a few dresses lately. The contrast btn the white and red is perfect. And when something is so beautiful, you MUST wear it more often! You look ravishing! I envy you your sewing and costuming skills. I love the way you've tied your sash! And your shawl is perfect. So lovely, Hope you had a fab day.